the xray doctor: xrayoftheweek 48: where is the gas? xrayoftheweek 48: where is the gas? The #xrayoftheweek is this chest x-ray is someone who presented with chest pain following a bout of vomiting. There is a lot of gas where it shouldn't be - where can you see it? 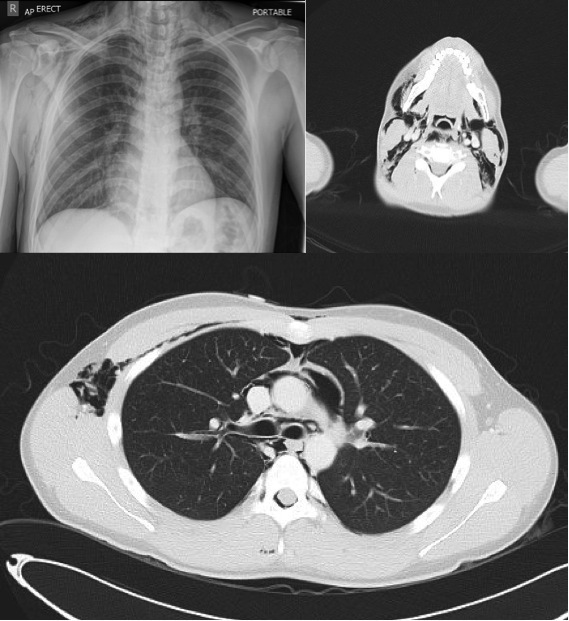 This chest x-ray shows classic features of Boerhaave syndrome with a pneumomediastinum, and free gas in the soft tissue spaces of the chest wall and the neck (surgical emphysema). There is no obvious pneumothorax, and no pleural effusion. The mechanism is a focal linear full thickness tear of the oesophageal wall following severe vomiting or retching, leading to gas dissecting through the mediastinum. The gas can then escape into other soft tissue spaces - the image below (from a subsequent CT) shows gas in the soft tissue spaces of the neck, surrounding the great vessels, in the epidural space of the spinal canal, and in the axilla. You can scroll through the whole CT stack on my Radiopaedia write-up of this case. Gas can also dissect into the peritoneal and retroperitoneal spaces. A CT is acquired with oral contrast to attempt to identify the site of the leak but often it will have sealed immediately, and to look for mediastinal or pleural collections. Focal oesophageal thickening or an intramural haematoma may also be seen.